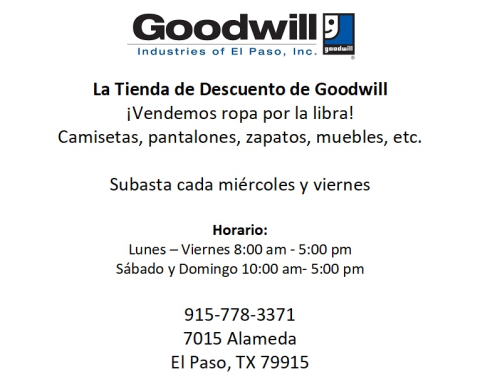 Stores – Goodwill Industries of El Paso Inc.
.85 cents out of every dollar spent at Goodwill stores in El Paso, Las Cruces and Socorro goes to supporting our mission. Our stores are stocked with everything from new to gently used clothing, housewares, books, jewelry, toys, furniture and so much more. 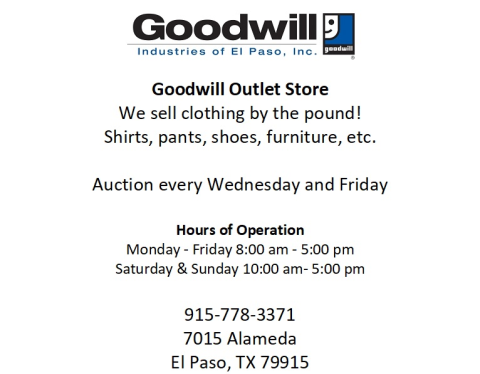 Visit your nearest Goodwill store frequently — the merchandise changes by the hour! Enjoy 50% savings at Goodwill with our Color of the Week Sale! Just look for the colored tag or sticker that corresponds to the items on each sale week. Just look for the colored tag on clothing that corresponds to the items on each sale week. Discount only applies to clothing. *exclusions apply. Discount does not apply to new goods, and orange and white tags.